Thymopoiesis is a complex process whereby developing T cells pass through a set of well-defined stages to generate a pool of naïve T cells with a diverse T cell receptor repertoire (Figure 1). This process is critically dependent on the close interaction between developing T cells and supportive cells in the thymic stroma, including hematopoietic cells, such as macrophages and dendritic cells, and non-hematopoietic cells, such as fibroblasts, endothelial cells (EC), and highly specialized thymic epithelial cells (TEC). All are critically important for thymocyte differentiation and expansion, and for inducing self-tolerance. Figure 1. Schematic of thymopoiesis. Adapted from Dudakov et al. 2010 Trends Immunol 31:191-198. The Dudakov Lab is addressing fundamental questions of regenerative immunology: 1) what are the mechanisms and triggers underlying endogenous thymus regeneration; 2) are findings in mouse models translatable into the human immune system; and 3) can these findings be exploited to develop therapies for patients with a depressed immune system? It is anticipated that our studies will provide considerable insight, not only towards understanding the processes underlying thymic regeneration, but also in the development of novel strategies for preventing immune deterioration in the first place. Although the thymus has considerable regenerative capacity, the processes underlying this regeneration are poorly understood. Our work has demonstrated that innate lymphoid cells (ILCs), and their production of IL-22, can drive endogenous thymic regeneration by promoting proliferation and survival of TECs (Figure 2). However, our understanding of these cells and their specific mode of action is still incomplete. Although extremely elusive in the past, the identity of a thymic epithelial progenitor cell (TEPC) has been resolving in recent years. Together with our findings implicating a role for IL-22 in stimulating intestinal stem cells, one hypothesis that we are exploring is that IL-22 is capable of acting as a mitogenic factor for TEPCs. ILCs have emerged as an important mediator of epithelial maintenance and regeneration in multiple tissues, and we have described their pivotal role in thymic regeneration. Our studies also revealed that, unlike other lymphoid cells, ILCs are extremely radio-resistant, with little if any cell depletion after even very high doses of irradiation. Given this damage-resistance, one focus of the Dudakov Lab is to comprehensively explore the biology of these cells, in particular concentrating on their cycling kinetics, survival, and differentiation. Additionally, our preliminary data suggests that IL-22 is not the only factor produced by ILCs to mediate thymic repair and we are currently exploring these additional, heretofore unknown factors. Little is known about the events that trigger endogenous tissue regeneration. Using mutant mice with well-defined blocks in T cell development, our IL-22 studies discovered a novel trigger for endogenous thymic regeneration; i.e. the depletion of CD4+CD8+ double positive (DP) thymocytes (Figure 3). Through the process of positive selection, 99% of DP cells undergo apoptosis or death by neglect. Therefore, one hypothesis is that the loss of an inhibitory signal, caused by DP depletion, triggers intrathymic regenerative pathways. In fact, there is some evidence for this as recent studies have demonstrated that apoptotic cells can reduce the production of IL-23 by dendritic cells (a key regulator of ILC function). Moreover, there is also some indication that DCs require interaction with fibroblasts for their production of IL-23, which is significant as fibroblasts also have an important role in aiding thymic regeneration through their production of thymopoietic growth factors such as KGF, IL-7 and SCF. Using in vitro and in vivo models, the Dudakov Lab is exploring the damage-sensing triggers underlying Il-22-mediated thymic regeneration. We are also testing if these same mechanisms can induce the production of other putative regenerative cytokines, such as KGF, IL-7, SCF and VEGF. Given the novelty of defining a damage-sensing trigger of endogenous tissue regeneration, it is anticipated that these studies could yield substantial insight not only to thymic regeneration, but also to damage and regeneration in other tissues, such as gut and liver. Figure 4. The thymus is extremely sensitive to damage (e.g. by irradiation, cytoreductive chemotherapy, corticosteroids). While most of these target T cell progenitors (esp. DP thymocytes), TEC are also notably targeted by irradiation and chemotherapy. ILC and EC, and fibroblasts (FC) and DC to a lesser extent, are remarkably damage resistant. Moreover, the thymus is remarkably able to regenerate itself after injury, likely by multiple pathways, including TEC-targeting IL-23/IL-22 and KGF pathways, and TEC-/FC-produced and early T cell progenitor (proT)-targeting LI-7. In addition, VEGF can be produced by TEC and some thymocytes and targets EC to induce angiogenesis, a crucial step in organ regeneration. From Chaudhry et al. In Press Immunol Rev. 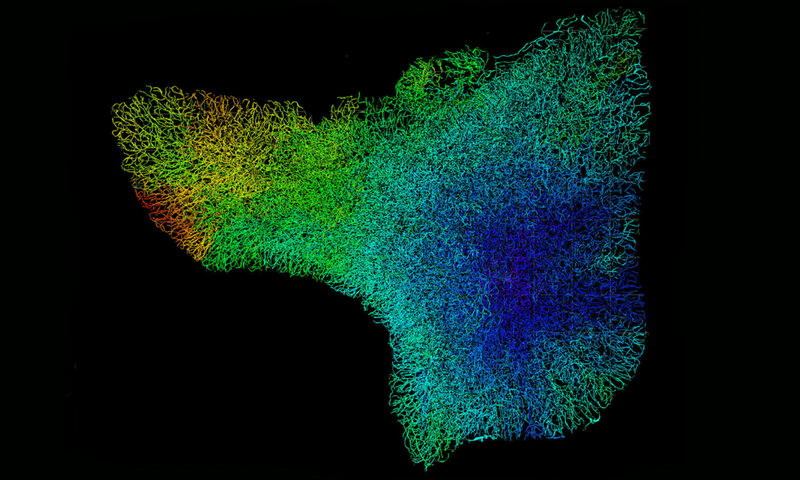 Our preliminary studies suggest that there is considerable interaction between regenerative networks in the thymus. In particular, transcriptome analysis of IL-22 target cells has revealed two potential mechanisms by which IL-22 mediates its effects on TECs; i.e. by 1) directly promoting TEC proliferation through upregulation of proliferation-associated and 2) reducing expression of negative signalling regulators such as Socs3 (an inhibitor of cytokine signalling) and Tnfrsf11b (osteoprotegerin, a RANKL decoy receptor). This suggests a possible secondary role for IL-22 in promoting enhanced responsiveness to other regenerative factors, such as KGF, BMP4 and RANKL, all of which are incidentally increased in the thymus as part of the regenerative response after immune injury. Moving forward, the Dudakov Lab will explore the hypothesis that one of the main roles of IL-22 is to promote the response of TECs to other extrinsic stimuli. In fact, our initial assessment of mice deficient for both IL-22 and KGF (which we have recently generated) suggest that, in contrast to isolated deficiencies in either IL-22 or KGF, double KO mice have a specific depletion of TECs even at steady-state. This suggests that IL-22 and KGF are redundant for each other. The Dudakov Lab will thus explore these findings to develop an integrative model detailing the cooperation between growth factors in the steady-state thymus as well as during periods of regeneration.